With winter tightening its grip on the Northeast, the majority of anglers will be hanging up their tackle for the season. Even those planning a couple of cold weather bottom fishing excursions during January and February are putting all but a select few of their rods and reels to bed. And that means it's time for the dreaded winter maintenance. For most of us (myself included), there's a tendency to look upon this chore with disdain, which naturally leads to procrastination. Wrong approach! From the practical viewpoint, tackle represents a sizeable monetary investment, and there's no sense in allowing that investment to depreciate prematurely for want of proper care. On a more emotional level, there are plenty of legitimate ways to lose that trophy fish without adding equipment failure resulting from poor maintenance to the list. Instead of "winter maintenance", perhaps we're better off thinking of it as the first step toward spring fishing success. To get started, I suggest removing reels from rods. Wash both with a solution of warm, soapy water to get rid of the salt. There are many cleansers that will do the job, but Dawn or similar dishwashing liquids are as good as anything. Just be sure to remove any cleanser residue with a gentle spray of clean water. Notice I say "gentle" because powerful blasts from a hose could drive residue or dirt particles into nooks and crannies where you really don't want them. Rods and reels can be dried with a terry cloth rag or left to dry on their own. Rod maintenance is less labor-intensive than reel maintenance, so naturally I tackle it first. Often, fish blood and small scales will remain on the rod grips after that initial wash and rinse. Foam grips clean up nicely with a dish towel, warm water and a little extra cleanser. For cork grips, you might try rubbing them with superfine steel wool which not only removes all but the most deep-set stains, but restores that like-new look as well. Guide wraps should be scrubbed with a soft toothbrush. I never fail to check the guides by running a cotton swab or small strip of pantyhose through each one. If the cotton or nylon snags, I know there is an abrasion in the guide, and guide replacement is added to my to-do list. Can't afford to lose The Big One to frayed line. It's also wise to check the guide wraps for looseness or hints of wear, then re-wrap if necessary. 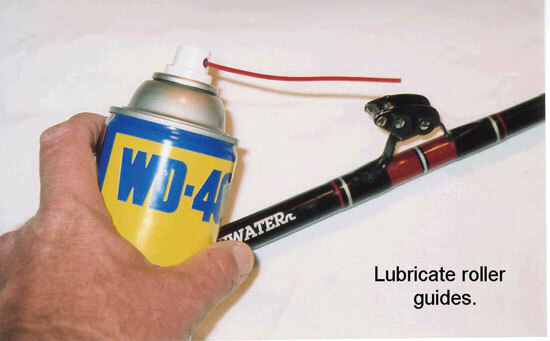 Roller guides will require a spritz of CRC or WD-40 to keep them in good operating condition. Don't forget to inspect reel seats for salt buildup or corrosion. This may cause the reel to sit improperly and wobble on the seat. Clean metal seats by applying a paste-type metal polish such as Flitz to a strong cloth and rubbing firmly. For threaded areas, apply some polish to a toothbrush and scrub. Remove any remaining polish with a damp cloth. Plastic reel seats can be sprayed with Spray Nine or Fantastik, then wiped clean. If the rod is a two-piece, consider giving the ferrule a light coating of beeswax or paraffin. Before storing your rods, wipe down the blanks with Armor All. 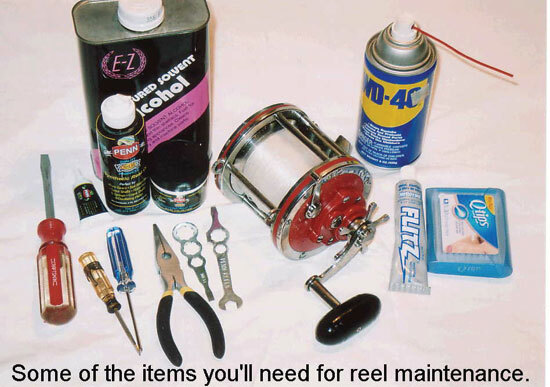 Don't lean your rods against the wall, as they may develop a "set" or permanent bend. Instead, store them in a rack, either horizontally or vertically - it's your choice. Just be sure horizontal racks support the rods at both ends, as well as in the middle. Keep storage racks clear of heaters and direct sunlight, both of which may damage blanks and wrappings. And now, on to the reels.